This is probably not a confession a celebrity gossip blogger should make, but if you showed me a picture of Harry Styles standing alongside a handful of other young dudes picked at random from inside a Uniqlo and told me it was a photograph of a One Direction reunion, I’d believe you. At this point, dozens of interchangeable-looking men have been grouped into fives to sing and dance for teenage girls’ amusement until they age out of the job and are replaced by a new, almost identical set. 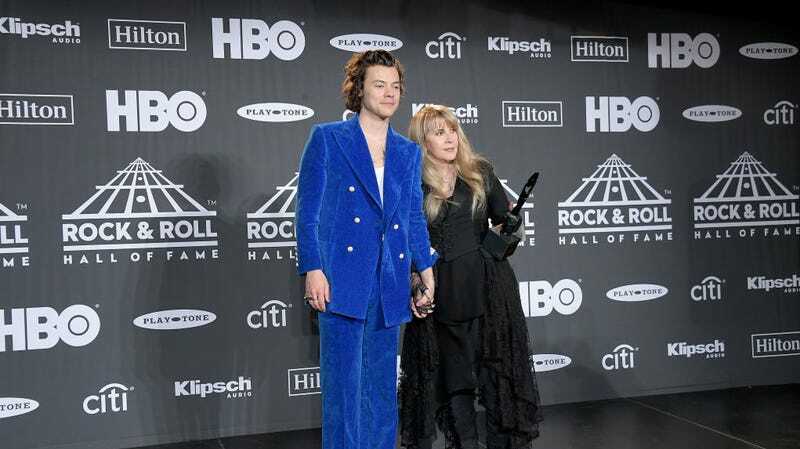 So get off Stevie Nicks’s nuts about not knowing her boy bands is what I’m saying. “What I really loved about Harry was that when he decided to make a solo record from NSYNC,” she began before quickly realizing her mistake and course correcting. In my mind, Nicks has thought Harry Styles was Justin Timberlake this entire time and only just realized they’re two different people last night. But the loan appears to be outstanding because Gifford joked “I want that money back.” Yeah, maybe with interest.